The new series will be revealed Saturday, May 5, 2018 from 1:00 p.m – 7:00 p.m. at the Eve J. Alfille Gallery and Studio, with guests enjoying festive refreshments, live music, winnable prizes, and Evanston-made art jewelry. 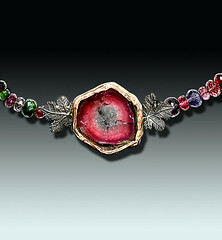 All jewelry by Eve Alfille. There are a few things in life that are as universal as they are self-evident: food is one. It seems that Nature has explicitly directed that sweet things go directly to the head of the pleasure line, perhaps ahead of all others. And humans acknowledge this by giving immoderate veneration to their desserts, by cosseting them in special decorative vessels, by adorning them to the point of extravagance, by giving them a special place in the processional order of the meal. We shake our heads when told of the wondrous goings-on at the palace in Versailles: the lineup of waiters, each bearing an ever-higher dessert, the pastry chefs vying for who could create a more teetering ‘pièce montée’ of candied fruits, pastry and fondant. But hey, just behold the petit-fours at the bakery! Who can say that Versailles isn’t still with us? The unapologetic cuteness, the unnecessary swirls of frosting, the poufs of sweet cream! You know, I just think that desserts, to us, are the jewelery of the meal! There is the old rationale for the emergence of jewelry in human culture: originally perhaps as a marker of transcendence, then a talisman for protection, to become a beacon of status. You don’t need jewelry, but it gives you a boost in many ways–it occupies a special place in human cravings, and we expect it to be exquisitely formed. Well, doesn’t the same go for our sweet indulgences? If it’s your birthday, and an unadorned slab of cake appears; what a disappointment! Here is the sundae I ordered…what, no nuts or cherry on top? If it’s dessert, it must be somehow fancied-up! True that sugar can appear in main dishes as well, sweet and sour pork or sauces. But this only shows that it is not just the sugar, but the social constructs. We do not need sweet foods, but they mesmerize us…we idolize them, wrap them in bright foils and frilly skirts, hold them out as rewards, turn to them in consolation, acknowledge them as guilty pleasures. Even use them, sometimes, to trade for personal safety. Four years of my childhood were spent under war conditions–rationed foods, dark bread, no meat, butter, or sugar. We lived under assumed identities. My forward-looking mother had somehow managed to stash away a few pieces of wrapped candy: I was told I could have one once a year for my birthday, and you can imagine how I anticipated the little ceremony of unwrapping it and sliding it slowly into my mouth. But one time, as I was tossing and catching a ball, it veered off, and broke a neighbor’s window. These were the dark years, no telling if the neighbor would be understanding, or report us to the Gestapo. My mother, when she heard, seemed very upset. She immediately went to her special closet, brought out two of the precious candies, wrapped them in a newspaper cone and instructed me directly to take them to the neighbor and make my excuses. I was furious, and bawling! Me, she only gave me one a year, and here the neighbor would get TWO! And what seven-year old wants to go ‘make excuses’ (i.e. apologize)?! I don’t remember how the neighbor received the apology–I think my mother ended up going with me, and I felt plenty guilty when I finally understood it could have been a matter of life and death for us. 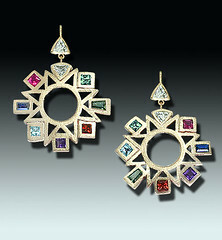 Please send RSVPs to either 847-869-7920 or contact@evejewelry.com. 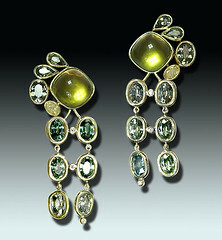 To learn more about Eve Alfille and see more of her works, visit http://www.evejewelry.com. One of the hottest topics of 2017 has been the happy news that England’s most eligible bachelor has finally locked it down with American actress Meghan Markle. The whole world has been a-buzz with the ensuing frenzy of planning their spring wedding…but could it be that a hot proposal by Prince Harry could also lend some interesting insights into the hot, harrowing history of the earth’s crust? The Botswana resort where Meghan and Prince Harry fell in love. …Of course, no royal proposal would be complete without the perfect, fairy-tale ring…a romantic at heart, Prince Harry used diamonds from his mother’s private collection, as well as a central diamond hailing from Botswana (where the royal romantics met). These days, the African nation enjoys a climate of relative volcanic peace compared to what once was: a clime so fraught with explosive volcanic power that it rained diamonds on more than one occasion (an event which would have pleased the likes of Marilyn Monroe, but for the scalding ash and magma that came with it!). It’s no secret that Botswana has boasted more diamonds than any other part of the world since the eighties…while it’s true that these lovely, lustrous gems can exist anywhere in great quantity, in most parts of the world they’re also inconveniently located 100-or-so miles underground. It takes a historically massive upheaval to send them into the air and a bit closer to the surface for miners and princes alike to easily find. Research by scientists like Janne Koornneef has indicated two such events in the region Markle’s diamond hails from, both 1.1 billion and 3 billion years ago. This first batch was caused when the Zimbabwe Craton -a rather sizeable chunk of the earth’s crust- broke free and slammed into a neighboring craton! The second time a diamond-scattering took place, it was during a time from whence the ‘Umkondo Large Igenous Province’ drew its name…the entire region was completely transformed by the large and overactive volcanoes covering the terrain. …Not so interested in tackling the trip to Botswana for a blind date, like the auspicious pair did, or in facing walls of steaming ash for your diamonds? Maybe consider giving a visit to the Eve Alfille Gallery & Studio up in Evanston instead!